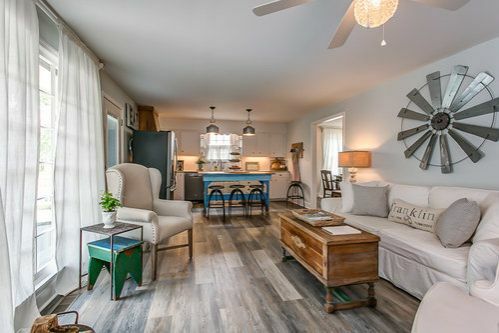 Sarah McConnell fell in love with Leiper's Fork, Tennessee, after her very first visit in 2010 — so much so that the California native purchased a second home in the area. The interior decorator at heart cherished the region so much, she wanted to share it with others. Thus, House + Sanctuary was born, now managing seven vacation rental properties in Tennessee. 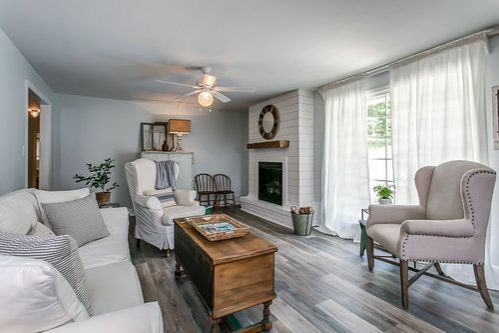 This Cozy Cottage is situated just five miles from historic downtown Franklin, a 30-minuted drive from Nashville. 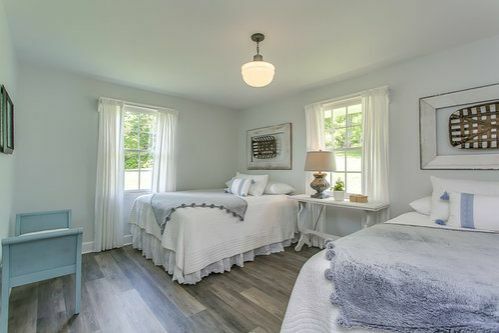 The cottage offers the perfect respite for musicians looking for some quiet or families hoping to soak up the area's history (such as a Revolutionary War cemetery on the property). 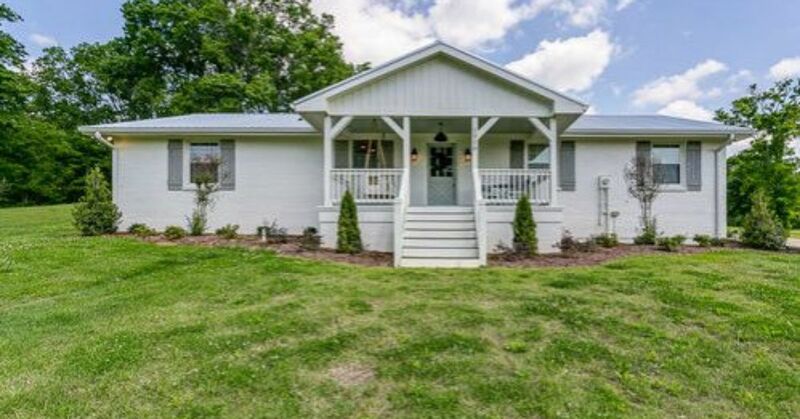 Inside, the ranch-style home has been renovated and completely updated. Farmhouse touches abound, such as the barn door in this living space, a vintage dresser serving as a TV cabinet and a rustic hide rug. The hearth room opens up to the roomy kitchen. A large pull-out sofa and spacious armchairs offer seating for a crowd. The room also features a ship-lapped gas fireplace for cozy nights hunkering inside. 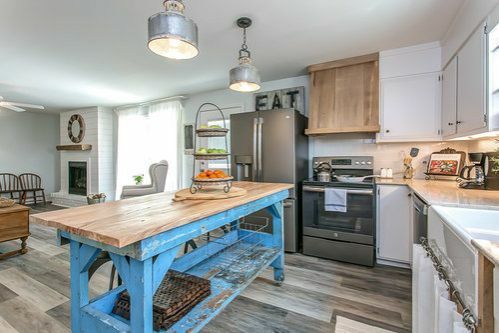 The open kitchen concept features a unique kitchen island, built from an elm tree harvested on the property. A large farmhouse apron sink is coupled with stainless steel appliances and clean white cabinetry. The dining room contains a large table with iron cafe chairs anchored under a vintage pendant chandelier. 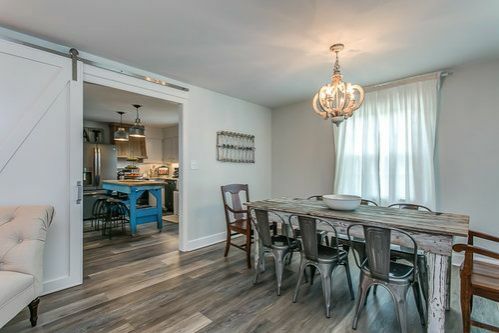 A large barn door slides to close off the kitchen for added privacy. 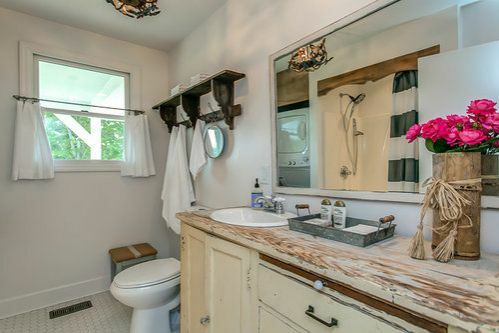 One of two bathrooms, this space features white penny tile flooring and a vanity fashioned from an antique dresser. A large mirror above the vanity reflects light from the window. Three bedrooms are perfect for sleeping a large group or family on the property. This vintage iron bed is painted in a sleek white. 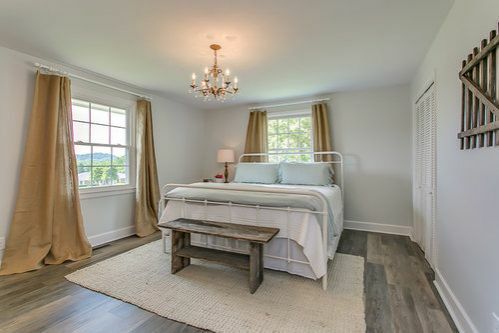 Two double beds are surrounded by windows for a light and airy room. 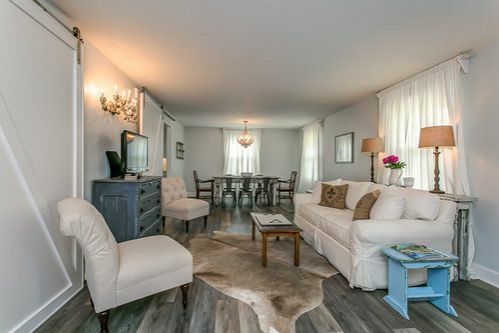 There is also a small daybed/settee in the space. 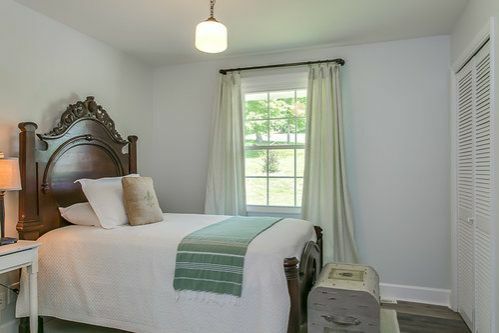 A stately antique-style bed offers a Victorian aesthetic in the third bedroom. All together, the home can sleep up to nine guests. 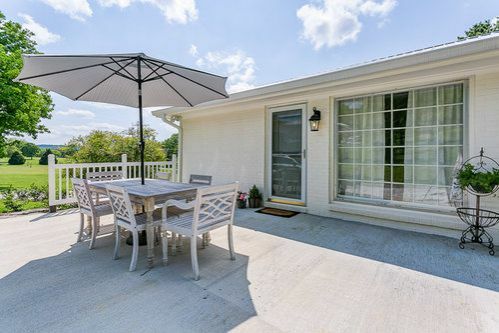 Out back, a covered picnic table provides a spot for al fresco meals on the deck. Keep the party going into the wee hours by gathering around the outdoor fire pit tucked in the yard beyond.